Robert Francis Kennedy (1925-1968) was a younger brother of President John F. Kennedy. 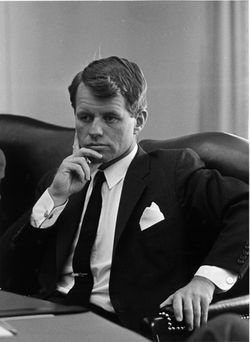 Robert, also known as "Bobby" Kennedy or RFK, served as Attorney General during his brother's presidency. Robert was considered one of John's closest advisers. He was a strong supporter of Civil Rights issues and was primarily known for his fighting of Organized crime. Robert Kennedy started his legal career in the Criminal Division of the Department of Justice in 1951. In 1953, he served with Roy Cohn as counsel to Senator Joseph McCarthy's Committee on Government Operations and Permanent Subcommittee on Investigations. He became nationally known for his anti-Mob activities while working as chief counsel of the Senate Select Committee on Improper Activities in the Labor or Management Field, a post which he left in 1960 to work on his brother's presidential campaign. After the election, John Kennedy appointed him to be Attorney General. At 36, he was the youngest man to serve in this position. As Attorney General, Kennedy was alarmed by Federal Bureau of Investigation reports that two of the Reverend Dr. Martin Luther King, Jr.'s closest advisers, Stanley Levison and Hunter Pitts "Jack" O'Dell, were secret operatives of the Communist Party's underground "apparatus." “ I told the AG that ... in so far as Dr. King was concerned, it was obvious from the reports that he was in a travel status practically all the time, and it was, therefore, doubtful that a technical surveillance on his office or home would be very productive. I also raised the question as to the repercussions if it should ever become known that such a surveillance had been put on Dr. King. The AG said this did not concern him at all, that in view of the possible Communist influence in the racial situation, he thought it advisable to have as complete coverage as possible. I told him, under the circumstances, that we would check into the matter to see if coverage was feasible, and, if so, would submit an appropriate recommendation to him. This surveillance was later continued and expanded during Lyndon B. Johnson's presidency. Robert stayed on after his brother's assassination, resigning in September 1964. He then ran a successful campaign for Senate, and took office as Senator from New York in early 1965. Kennedy ran for President of the United States as a Democrat in the 1968 election, but was assassinated just months before. Robert Kennedy was assassinated by Sirhan Sirhan on June 6, 1968 while running for the Democratic Party nomination for President of the United States against his principal opponent, Senator Eugene McCarthy of Minnesota. It is believed that Sirhan Sirhan carried out the assassination because of Kennedy's strong support for Israel. Neither Kennedy nor McCarthy won the party nomination; instead the party choice fell on Vice President Hubert Humphrey, also of Minnesota, who prevailed among delegates without entering a single primary contest following the withdrawal on March 31, 1968, of U.S. President Lyndon B. Johnson. Humphrey went on to be defeated for the presidency by Republican Richard M. Nixon in 1968. This page was last modified on 26 September 2018, at 14:39.